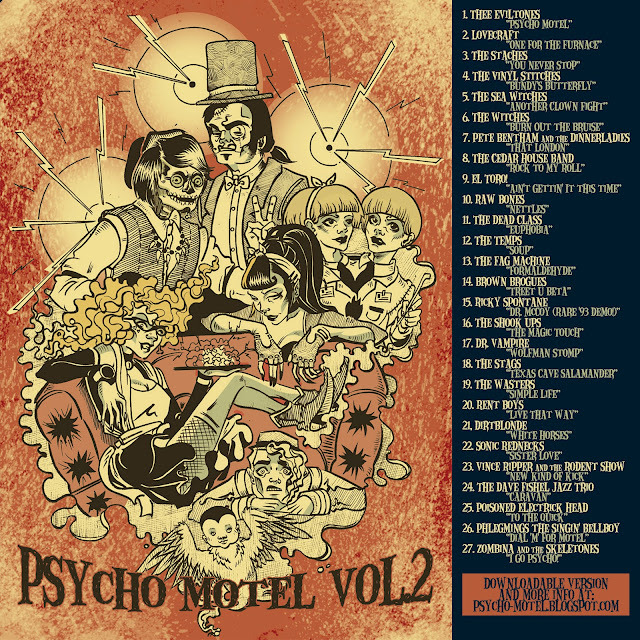 Psycho Motel Vol.2 (2011-2012) FREE COMPILATION!!! Here it is, folks! Psycho Motel Vol.2, another FREE compilation featuring every band to play Psycho Motel since Volume 1 (except Bad Taste Barbies, an oversight for which we sincerely apologise)... 27 tracks of non-stop garage, rock n' roll, punk, surf, gothic and weirdness. 01 Thee Eviltones - "Psycho Motel"
02 Lovecraft - "One For The Furnace"
03 The Staches - "You Never Stop"
04 The Vinyl Stitches - "Bundy's Butterfly"
05 Sea Witches - "Another Clown Fight"
06 The Witches - "Burn Out The Bruise"
07 Pete Bentham and the Dinnerladies - "That London"
08 The Cedar House Band - "Rock To My Roll"
09 El Toro! - "Ain't Gettin' It This Time"
10 Raw Bones - "Nettles"
11 The Dead Class - "Euphobia"
12 The Temps - "Soup"
13 The Fag Machine - "Formaldehyde"
14 Brown Brogues - "Treet U Beta"
15 Ricky Spontane - "Dr McCoy"
16 The Shook Ups - "The Magic Touch"
17 Dr Vampire - "Wolfman Stomp"
18 The Stags - "Texas Cave Salamander"
19 The Wasters - "Simple Life"
20 Rent Boys - "Live That Way"
21 Dirtblonde - "White Horses"
22 Sonic Rednecks - "Sister Love"
23 Vince Ripper and the Rodent Show - "New Kinda Kick"
24 The Dave Fishel Jazz Trio - "Caravan"
25 Poisoned Electrick Head - "To The Quick"
26 Phlegmings the Singin' Bellboy - "Dial 'M' For Motel"
27 Zombina and the Skeletones - "I Go Psycho!" P.S. 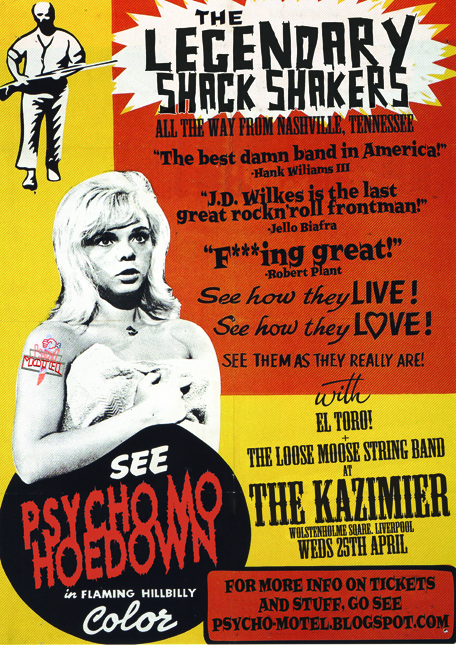 Go get your Legendary Shack Shakers advance tickets from Curious Orange, Renshaw St. or from http://www.seetickets.com/Event/THE-LEGENDARY-SHACK-SHAKERS/The-Kazimier/626761 before you miss your chance!!! 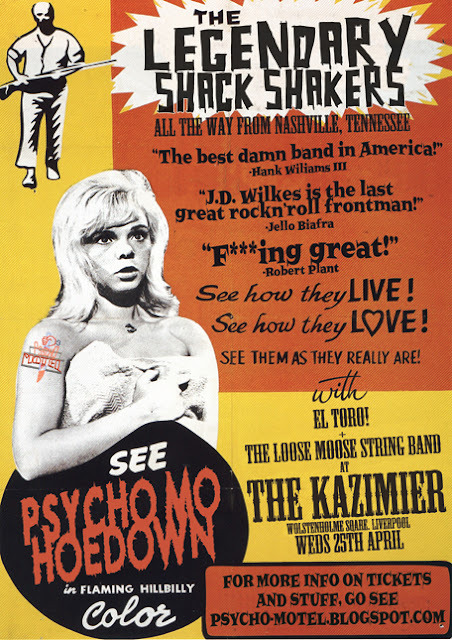 We'll be selling Shack Shakers tickets on the door here, too. And we've got two to give away to the first people to recognize a Legendary Shack Shakers record when we play it! 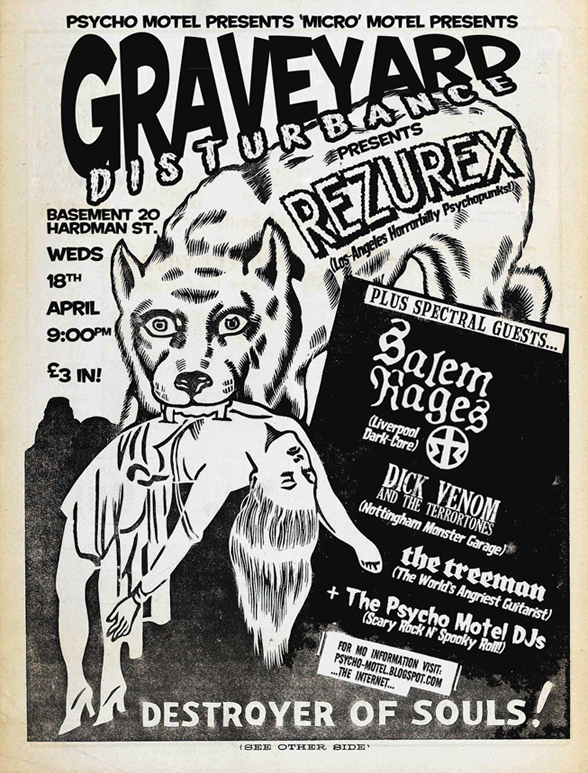 ...The Psycho Motel DJs promise to play only the scariest, most Halloweeniest rock n' roll we can muster all night. So come on down. It's only three quid, like.